Perceptions of the Great War have changed significantly since its outbreak and children's authors have continually attempted to engage with those changes, explaining and interpreting the events of 1914-18 for young readers. 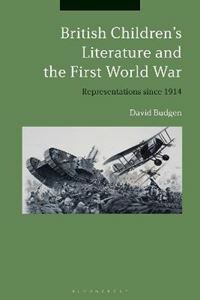 British Children's Literature and the First World War examines the role novels, textbooks and story papers have played in shaping and reflecting understandings of the conflict throughout the 20th century. David Budgen focuses on representations of the conflict since its onset in 1914, ending with the centenary commemorations of 2014. From the works of Percy F. Westerman and Angela Brazil, to more recent tales by Michael Morpurgo and Pat Mills, Budgen traces developments of understanding and raises important questions about the presentation of history to the young. He considers such issues as the motivations of children's authors, and whether modern children's books about the past are necessarily more accurate than those written by their forebears. Why, for example, do modern writers tend to ignore the global aspects of the First World War? Did detailed narratives of battles written during the war really convey the truth of the conflict? Most importantly, he considers whether works aimed at children can ever achieve anything more than a partial and skewed response to such complex and tumultuous events.